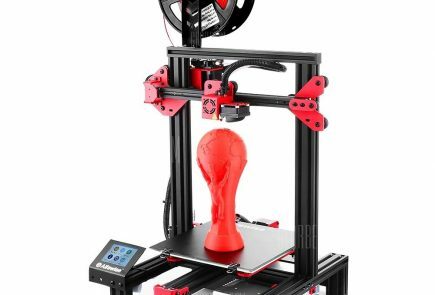 Tevo Tarantula is a desktop DIY 3D printer kit manufactured by TEVO, a young 3D printer company based out of Zhanjiang, China. 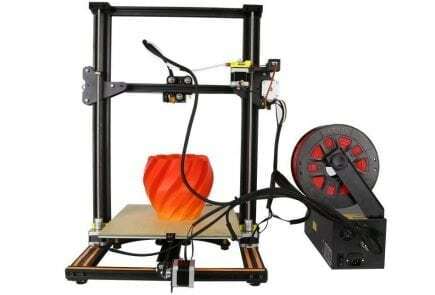 The Tarantula 3D printer is essentially modeled on lines of the architecture of the classic RepRap PRUSA i3 3D printer, and thus, bears its hallmark of simplicity of design and robust functionality. The most striking feature of this Tevo Tarantula DIY 3D printer kit is its versatility in terms filament, extruder, and nozzle compatibilities. A thriving online community of passionate users definitely comes a close second. All in all, the Tevo Tarantula is a highly affordable 3D printing kit that delivers on the promise of high-quality printing. The well-arranged, branded packaging of the TEVO Tarantula clearly sets it apart from other DIY 3D printers in its category. The Tevo DIY kit arrives in a sleek black packaging that contains the different parts of the printer – neatly arranged across three foam trays – supporting documents, an instruction manual, and a separate plastic bag containing screws, tools, nuts, and bolts to put the whole thing together. The assembly instructions on the manual, however, aren’t always on point, which means you can be left to your devices more often than not. It can take quite a bit of trial and error, besides your common sense, to put the Tarantula together if you rely solely on the instruction manual to set it up. Or you could leverage the strong online presence of TEVO Tarantula enthusiasts to cut down the setup time by half. There are quite a few Facebook groups dedicated to the TEVO Tarantula, where experienced users have shared Tevo Tarantula assembly how-to videos among other useful tips on assembling this DIY 3D printer kit. 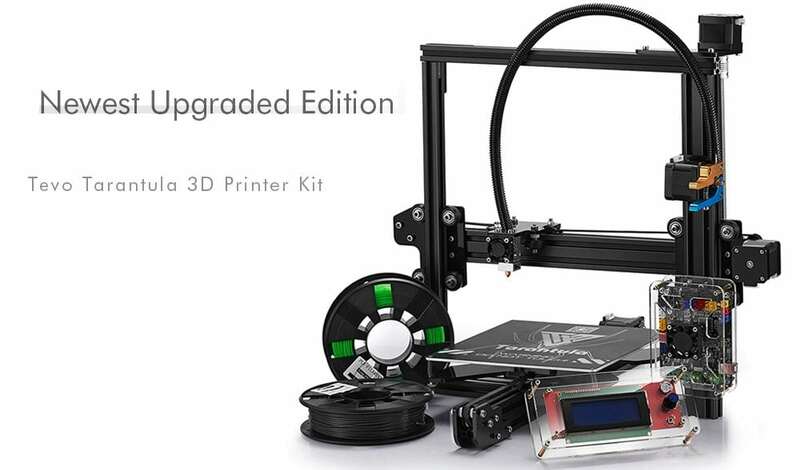 Just follow their lead, and assembling the Tarantula 3D printer will seem like a breeze. Of course, the largely flawed instruction manual does not reflect well on Tevo, as it is indicative of oversight, poor quality control, and a lack of concern for customers’ convenience. However, these first-world complaints can be overlooked when the necessary solution for arranging the entire printer is just an internet search away. Between assembling the TEVO Tarantula and getting started with your first print job, you need to work on the print calibration, which is fairly simple. It requires a little tweaking of thumb nuts on the four corners of the print bed, lowering or raising the corners as you go just enough to be able to slice a sheet of paper below the Tevo Tarantula nozzle with some resistance. The Tarantula is a classic Cartesian-style 3D printer modeled on lines of the famous Prusa i3 and designed to support fused filament fabrication. The printer sports an X-axis placed on rail-mounted pulleys, which is used to move the print head back and forth, whereas the Y-axis that is also placed on rail-mounted pulleys moves the heated bed. It is also fitted with eccentric nuts for tightening the bed carriages and print head from time to time, in case they loosen up after a particular print job. 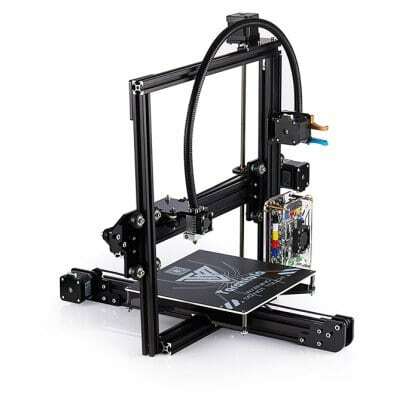 The standard variant of the Tarantula is a single extrusion device, where the filament is delivered through a Bowden extruder placed on the frame right above the main board. This board has some extra connections to accommodate an additional extruder and hot end, making it possible to upgrade your standard TEVO Tarantula to dual extrusion. The aluminum frame of the printer not only lends it a clean and sleek design but also serves well for making upgrades such as the addition of extruders or frame stabilizers. The one drawback in terms of design is its grippy print bed, which makes removing prints a bit of struggle. Some force needs to be applied when pulling off prints from the bed, which can force the print bed to tip, and require you to re-level the bed before moving on to the next print job. 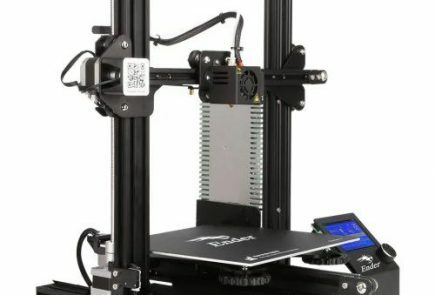 The most recent version of the TEVO Tarantula offers a build volume of 200x200x200 mm, which is pretty much standard for most Prusa i3 clones in the market today. 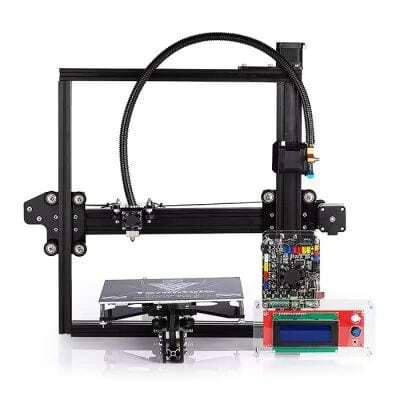 The printer is also available in a slightly larger variant, where the Z-axis accords a build space of 280 mm. The standard variant is a single extrusion device minus the auto bed-leveling feature. The printing process is handled by TEVO’s stock hot end, which comes fully assembled even in the standard variant of this printer. The provision of the heated bed adds to the filament versatility of this machine, making it compatible with a host of filament types such as PLA, Flexible PLA, ABS, PVA, HIPS, and wood. With the addition of a full metal E3D Bowden extruder, known as the Pro extruder, the TEVO Tarantula can also be used to print with Nylon filament. The Tevo Tarantula nozzle size is also capable of producing really fine layer heights of 0.05 mm or 50 microns, which is a big draw for a 3D printer under $500 price range. A special coating on the print bed, with a BuildTak-like substance, also contributes remarkably to the level precision and detail in prints. The TEVO Tarantula 3D printer is designed to offer some decent prints straight out-of-the-box but you’ll need to work with due diligence, overseeing the printing process and resetting its sensitive bed level, to get some fine quality prints from this printer. The fine layer thickness of 50 microns contributes greatly to bringing impressive detail to the prints. The lack of a cooling fan, however, is a limiting factor here, as it is nearly impossible to print small or intricate parts without it. The versatility, finesse of printing and the support of a large online community are some of the key factors that work in favor of the TEVO Tarantula. Of course, this DIY 3D printer has some inherent flaws and drawback, but there is nothing you can’t fix with 3D printed modifications as well as other Tevo Tarantula upgrades. That is a big saving grace when working with the TEVO Tarantula. In the sub $300 3D printers category, the TEVO Tarantula is the closest you’ll get to printing with a quality PRUSA i3 clone. You can order the Tarantula from GearBest at a discount.